Most people, when they plan a Scottish drinks tour, will think first of whisky and, perhaps, beer. They probably won’t think about gin, vodka, tea or wine. Yet all of these are made right here in Scotland, from produce grown in Scotland – yes, even grapes – and many of them are winning international awards. Starting with whisky, the obvious place to start your tasting tour is Speyside, between Aberdeen and Inverness, continuing to Moray, north east of Inverness. This is classic Scottish (and Scotch) whisky country, producing a varied range of light, elegant, un-peaty malts. The Malt Whisky Trail runs along the Moray Speyside region, which you can read more about here. The driving is not for the faint-hearted – the roads around Grantown-on-Spey are quite steep, narrow and winding – but it’s worth the effort. Dalwhinnie, on the A9 south of Inverness, is easier to reach in a motorhome and produces a distinctive range of malts. Heading back down the A9 towards Perth, you can do tasting tours at the Blair Atholl Distillery and Bell’s at Pitlochry. Edradour, just up the hill from Pitlochry, claims to be Scotland’s smallest distillery; it accepts coaches so it’s definitely accessible by motorhome. The Famous Grouse Experience at the Glenturret distillery just outside Crieff is also worth a visit and, again, has plenty of parking space. 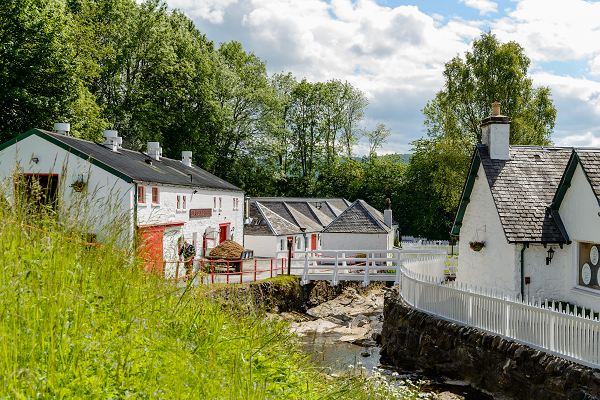 Based in Pitlochry, Perthshire, the Edradour distillery is claimed to be the smallest distillery in Scotland. If you prefer your malt whisky peaty, you’ll need to get out to the islands: Jura, Islay, Skye and the Orkneys all produce whisky in the heavier peaty style. Islay in particular is abound with whisky, and the Islay Festival, held in the last week of May every year, is a fantastic opportunity to visit the many distilleries across the island. The islands are worth visiting for themselves, too. You can cross the bridge to Skye, but the others are all a ferry-ride across the water and some of the ferries are quite small, so check before you travel. Caledonian MacBrayne operate ferries to the Islands and they will be best placed to advise on any restrictions. Why not go for a Scottish Brewery Tour? Still on the subject of islands, the Isle of Arran produces an excellent range of beers alongside its one whisky distillery. You can also take tasting tours at the Lerwick Brewery in Shetland and the Orkney Brewery if you’re heading to the far north of Scotland. For something a little easier to reach, try Traquair House near Peebles, which has its own in-house brewery as well as being an ancient fortified house with strong Jacobite connections, and is open most of the year. You could create your own mini Scottish brewery tour heading up the east coast, from Belhaven on the outskirts of Edinburgh, via Inveralmond Brewery just outside Perth and Eden Mill Brewery at St Andrews (which, uniquely, also has a whisky and gin distillery on the same site), to Brewdog at Ellon in Aberdeenshire, the world’s first crowd-funded brewery. The Black Isle, north of Inverness, is home to a brewery as well as whisky distilleries. There’s even a brewery in the heart of the Cairngorms National Park, at Aviemore; Aviemore is on the A9, so you don’t have to go mountaineering to visit it. So far so expected. But the latest diversification craze among Scottish farmers is to distil gin and vodka, spirits not normally associated with Scotland. Arbikie Farm and Hatton of Ogilvy Farm, both in Angus, distil vodka from potatoes; Arbikie also produces chilli vodka, gin and whisky. Sadly, neither farm runs tours (they’re both working farms) but you can buy the products online and in many bars around the country. Arbikie is not Scotland’s only distillery producing gin. Perhaps unexpectedly, 70% of Britain’s gin is actually produced in Scotland and distilleries are popping up like daisies all over the country, from Edinburgh to Shetland and the Isle of Harris. You can take tasting tours at Pickering’s Summerhall Distillery in Edinburgh, Strathearn Distillery at Methven in Perthshire (which is also one of Scotland’s newest whisky distillers), and the Isle of Harris’s “Social Distillery”, as well as the Eden Mill Brewery and Distillery mentioned above. No Scottish house is complete without tea but until recently the fragrant leaves were all imported. Now Scotland has its own tea-gardens – no fewer than nine of them! From the Isles of Mull and Arran to Castle Douglas and Dunkeld, Scotland is producing fine teas in every colour and style from white to smoked and black to chai. The Wee Tea plantation in Amulree has been so successful that this year it won the world’s most prestigious tea award, the Salon du Thé in Paris. And you can arrange a tour of Garrocher Tea Garden at Creetown, near Newton Stewart in Dumfries and Galloway, via their Facebook page. The prize for most unexpected Scottish drink production has to go to wine. There is now a real-live vineyard, Momentum, at Upper Largo in Fife, which has produced its first wine (though, it has to be said, it wasn’t universally approved; one taster described it as “not very drinkable”). The owner, who trained as a chef and hotelier at the Savoy Hotel, is looking to the long-term effects of climate change to justify his investment. In 2015 he produced no wine at all, so his optimism may prove unjustified. There are also vineyards on the Isle of Lewis (in polytunnels) and at Strathdon in Aberdeenshire but, wisely, neither is trying to produce wine. One winery you can visit and that has been making successful wines for years is Cairn o’Mohr on the Carse of Gowrie between Perth and Dundee. They don’t, however, use grapes. Their still and sparkling wines are made from the plentiful and excellent local fruit (raspberries, elderberries, apples, strawberries, currants and brambles), elderflowers and oak leaves (two versions). Cairn o’Mohr (run the words together…) also produce ciders and non-alcoholic drinks, have an excellent eatery, and run regular tours of their winery and cider house. They don’t take themselves too seriously, but they do make their wines seriously. Vaut le detour, as the Michelin Guide used to say – and they’re very easy to reach off the A90. That concludes your Scottish drinks tour. Hopefully you’ve found something to whet your appetite and make your holiday go with a swing. Just remember that the drink-driving laws are very strict up here (50 mg per 100 ml of blood, as opposed to the 80 mg you’re allowed in England), so go canny.